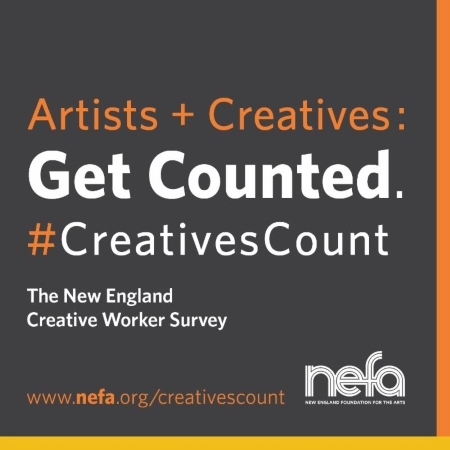 The New England Foundation for the Arts (NEFA) has launched Creatives Count, a survey of artists and creative workers in New England to better understand, support, and advocate for their work. NEFA is the Massachusetts Cultural Council’s regional partner supporting arts and culture. … are a vital part of our region’s vibrancy, but are often undercounted – and underserved – because of the fluid nature of their work life. You can help change that! The survey is designed to capture the complexity of creative work – please take this opportunity to convey how much you count. Help advocates, service providers, and other stakeholders ensure that creative workers are better served by employment analysis, program planning, and advocacy strategies. Survey closes November 18, 2016. Analysis of responses will be included in a report to be released Spring 2017.